Perched on a brilliant West facing corner lot just a few blocks to shops, eateries, schools and Rogers Park. 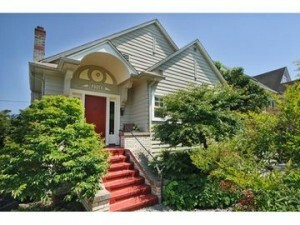 Immaculate 3 bdrm, 1.75 bath Craftsman home privately set slightly above the street (non arterial). Charm awaits you w/glistening hdwd flrs, Batchelder tiled fp w/beveled leaded glass built-in cabinets. Spacious living and fml dining rooms are perfect for entertaining. Delightful kitch w/eating area opens to deck. Rare 2 car gar, sweet gardens, new systems. A wonderful place to call home!